Thomas Adès: Concentric Paths—Movements in Music featured four choreographers who set dances to pre-existing works by the British composer, produced by Sadler's Wells London and at City Center as part of the White Light Festival. The highlight—the composer played piano or conducted for all four works, with the Orchestra of St. Luke's and the Calder Quartet. 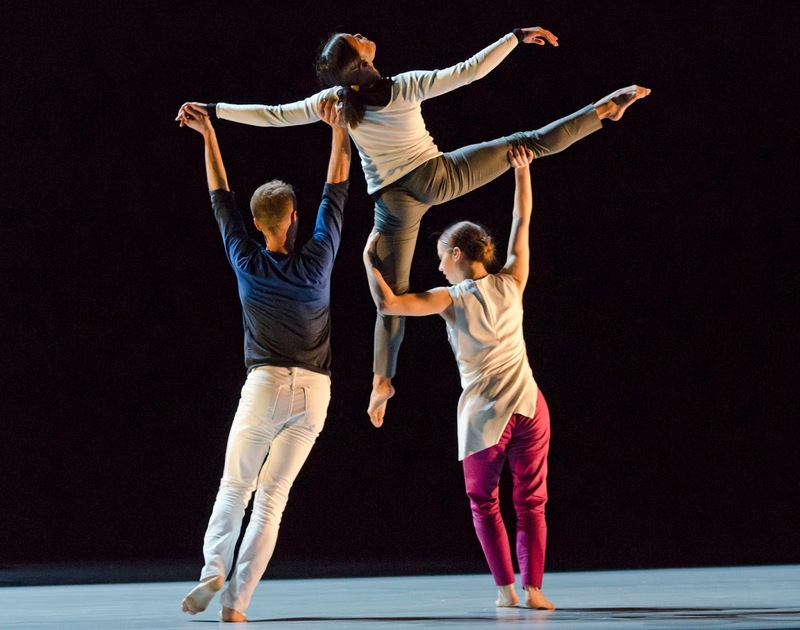 Two veteran dancemakers were included—the ubiquitous Wayne McGregor, and Karole Armitage. But the revelations were the dances by Crystal Pite, who created a giant 264-limbed organism, and Alexander Whitley, whose velvety, muscular style captivated. These four dances and their requisite personnel—prime among them the composer, hard at work—make this scale of presentation a rarity. 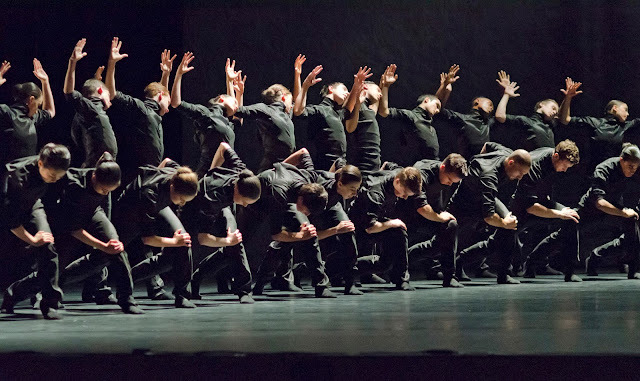 Pite's Polaris was easily the most popular piece on the bill, deploying 66 black-clad NYU students in mesmerizing shapes and formations, through which energy rippled and parted, like "the wave" done by fans in a baseball stadium, or magnetic filings being drawn to and fro. It is set to the pseudonymic 2010 composition by Adès, which includes a wondrous, yearning piano line, shades of a Bach symphony, and fractured notes coalescing into harmonic, organized order in the finale as the crowd looked up in anticipation, as if greeting ET's ship. In one scene, the dancers look like praying mantises, crouching low to the floor, elbows up; the insect evocation recurred in roiling swarms and mind-hive behavior. Kudos to lighting designer Tom Visser, who created an atmosphere of eerie moonlight and darkness, and Jay Gower Taylor's plowed-field-textured backdrop augmenting the alienscape feel. Pite's fluid and incredibly well-drilled piece would not be out of place on So You Think You Can Dance, or in an Olympics opening show, and it was a welcome addition on a highbrow slate. Alexander Whitley is a British choreographer who has spent time with the Royal and the Birmingham Royal Ballets, but whose work is rarely seen in New York. For The Grit in the Oyster, he chose Adès' 2000 Piano Quintet, which the composer played onstage with the Calder Quartet. Dancing were Natalie Allen, Wayne Parsons, and in particular the pliant and warm Antonette Dayrit, who led off and finished with an absorbing solo passage. Whitley's style is informed by ballet, but it's performed barefoot. At no point does any movement appear to be catalyzed simply for its own sake; the impetus arises unbidden and is carried through the dancers' bodies and limbs organically. It comes across as unaffected, muscular, and feline in its elegance and innate physicality. He frequently integrates floor work, building upon it with deeply planted lunges and triangular braced limbs; lifts include diamond- or scissor-shaped leg formations. The music begins with a dark piano line, and grows as all five instruments join in—fractured violin lines, warm cellos, darting rhythms, plucked and sawed strings. It's in contrast to McGregor's phrasing in Outlier (2010), which feels abound with random starts and stops. His ballet looks effortful and self-conscious, decorated with mannerisms and oddities. Adès' Concentric Paths violin concerto (2005) shocks from time to time with a seismic "boom" chord, threaded with keening or tumbling melodic lines. The dancers of McGregor's company wring the most out of his inside-out, hyperextended vocabulary but apart from its impressive athleticism, it fails to move. The fourth work stands apart for its literary derivation: Armitage's Life Story (1999) which uses the same-titled composition by Adès and poem by Tennessee Williams. Ruka Hatua-Saar and Emily Wagner take the stage in front of Adès on piano and soprano Anna Dennis. The narrative ponders the aftermath of a feverish romantic encounter, apparent in the dancers' brisk flirtations and forthright exchanged gazes. Armitage injects wit and sassiness into the duet, which mirrors the character of the aria—vaulting octaves with free abandon in dialogue with the piano part, and in turn, in dialogue with the dancers.